When it comes to Maryland vacation spots, there are many options to choose from. For a truly memorable summer vacation (or a break any time of the year), we suggest you break out of your routine and head to Deep Creek Lake to truly relax and recharge. Come stay with us at Lake Pointe Inn and find out why Deep Creek Lake is a favorite among Maryland Vacation Spots. Deep Creek Lake is the largest inland body of water in Maryland, covering 3,900 acres and offering visitors 69 miles of shoreline to enjoy. This man-made lake has made Garrett County, MD on of the most popular getaway destinations in the state. The area lends itself to a variety of activities year round, so no matter when you decide to pay us a visit, you’ll never be bored. During the upcoming warm months, you’ll find locals and vacationers alike out on the water. Lake Pointe Inn’s own pontoon boat, “Tight Squeeze” makes trips each evening, the perfect way to set the tone for a relaxed Deep Creek Lake night and take in the beauty of the lake’s shoreline. The inn also has kayaks and canoes for guest to use if you’d rather explore on your own. There are several rental options in the area. Deep Creek Lake is perfect for waterskiing, wake boarding or tubing, so boat rentals are another popular way of enjoying the lake during the summer. Located across from Lake Pointe Inn, Wisp Resort has many recreational opportunities year-round. This mountain resort has exciting activities to suite every mood no matter the temperature. In the warmer months, try golfing, the mountain coaster, scenic chairlift rides, mountain biking, laser games a climbing course and more. And if you’re more of a winter sports enthusiast, Wisp resort offers great skiing, snowboarding and tubing among other cold weather activities. So, Deep Creek Lake is truly one of the best all-season Maryland spots. 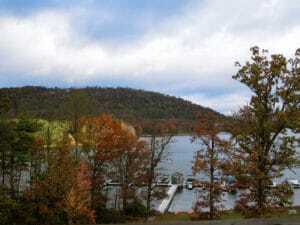 The Deep Creek Lake area has become popular among Maryland Vacation spots due to the diversity of activities available around the lake itself. Deep Creek Lake State Park has picnic areas, swimming beaches, fishing access and a Discovery Center. There are also ample opportunities for hiking and biking throughout the area. Meadow Mountain at Deep Creek Lake Recreation Area has a trail that passes by historic sites such as the Old Brant Mine and provides an opportunity for hikers to view local flora and fauna. To complete your Deep Creek Lake experience, a stay at a local bed and breakfast is a must. Our luxurious rooms are all decorated in the Arts and Crafts style, which complements the beauty of the rustic natural surroundings. Plus, your stay includes a complementary breakfast each morning so you’ll be ready for adventure. And nothing beats sitting in a rocking chair on our covered porch and enjoying the temperate weather in the summertime. Come to Lake Pointe Inn and we’re sure that Deep Creek Lake will become one of your new favorite Maryland vacation spots. See you soon!